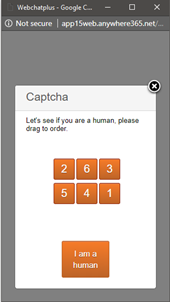 A captcha let you check if the user is a human, instead of a bot. If you want to enable Captcha, simply open and modify the Settings.xml (from C:\inetpub\wwwroot\WebChat_uccUCC stands for Unified Contact Center and consists of a queue that can be handled by Agents Each Contact Center has its own settings, interactive voice response questions and Agent with specific skills. Agents can be member of, or sign up to, one or more Contact Centers._name\sfbwebchatplus\xml\) file and change the Captcha parameter and set it to true. This will result in the following Captcha, which opens before a customer can start chatting.